Mydoom is a worm that spreads over email and the Kazaa Peer-to-Peer (P2P) network. 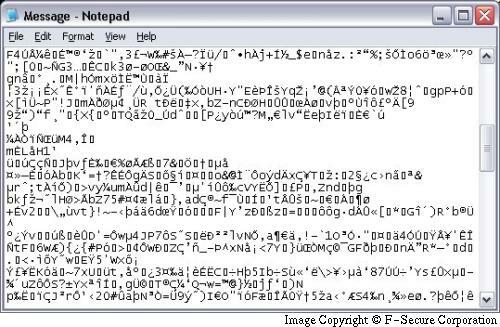 When executed, the worm opens up Windows' Notepad with garbage data in it. When spreading, the infectious email used to distribute the worm copies use variable subjects, bodies and attachment names. The worm encrypts most of the strings in it's UPX-packed body with ROT13 method, i.e. the characters are rotated 13 locations to the right in the abecedary, starting from the beginning if the position is beyond the last letter. Mydoom also performs a Distributed Denial-of-Service attack on www.sco.com. This attack starts on 1st of February. The worm opens up a backdoor to infected computers. This is done by planting a new SHIMGAPI.DLL file to system32 directory and launching it as a child process of EXPLORER.EXE. Mydoom is programmed to stop spreading on February 12th. The worm will launch a Notepad window with garbage contents. When run the worm will create a mutex with the name "SwebSipcSmtxSO" to ensure only one instance of itself is running at the same time. So it's run every time Windows starts up. This file will sequentially open TCP ports from 3127 to 3198, listening on them for incoming connections. One of the possibilities this backdoor offers is to receive an additional executable and run it on the already infected machine. When the worm is executed in a date after the Sunday 12th of February 2004 it will exit immediately, without performing any further actions. It will not, however, uninstall itself. 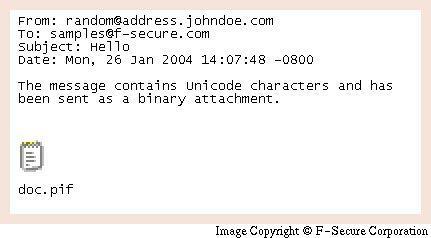 It try to bypass simple anti-spam protections i.e., like substituting the '@' symbol for ' at ' and several other combinations. The ZIP file itself is not harmful when doubleclicked. Inside the zip you have a copy of the worm, sharing the same file name as the .zip. For example, message.zip contains message.exe. The sizes of the ZIP files vary, but it's typically around 22kB. The infected file inside the zip can have double extensions, like "body.htm .pif". When the machine is booted after the Sunday 1st of February at 16:09:18 (UTC) (always according to the infected system's clock). A DDoS attack will be launched against SCO website. The worm will launch 64 threads, each of them requesting the main page of the website www.sco.com. This process of requesting simultaneously 64 times the page will be repeated roughly every second (1024 milliseconds) from each of the infected machines throughout the globe. The request is a simple "GET / HTTP/1.1", aimed to overload their webserver. This registry value makes Explorer to load the DLL as an extension so it is not visible as a separate process in Task Manager.